There are many reasons to keep your chainsaw sharp, first it is much easier to use a sharp chainsaw than a dull one, it is much safer to use a sharp chainsaw, you will finish the job much faster with a sharp saw, you will put much less wear and tear on your saw, you will save a lot on fuel, its just plain common sense. I grew up around people who used chainsaws on almost a daily basis, and I learned how to properly use a chainsaw at a very young age. One thing I have learned over the years is many people can learn how to start a chainsaw and cut with it, but most people who can start a saw and cut with it are clueless when it comes to sharpening them. Many people who use a chainsaw on an occasional basis, for cutting firewood, yard maintenance, storm damage, etc. simply take their saw to a professional to have it sharpened, and that works fine for a lot of people, but if you do any significant amount of cutting then you really need to know how to sharpen a chainsaw. There are several ways to sharpen a chainsaw, and many types of chain saw sharpeners.there are 12 volt sharpeners that can be used in the field by hooking them to your car battery, they have a little round grindstone that does the sharpening. There are 110 volt handheld sharpeners with a lot more power that are good when you have access to 110 voltage. There are bench mounted grinders with a grinding wheel, and there are round and flat files that use guides to keep the correct angle, and some people just use a round and flat file and freehand it without a guide. Most of these sharpening systems are fairly inexpensive and will do the job. You can do an internet search for chain saw sharpeners and learn the different types, one note depending on how you spell chainsaw ether as one word or two “chain saw” you will get different results, either way is fine. You will need to determine the size of the chain you want to sharpen, there are several size chains,1/4, 3/8, 5/32, 3/16, 7/32, etc. 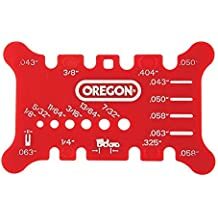 on some saws this information is right on the bar of the saw, if not you can check with the manufacturer or a service center, or you can get a chain measuring tool . You will need the correct size file or grindstone for the chain you are sharpening. The correct size file or round grindstone if you are using a handheld grinder like a small Dremel, will fit snugly into the round cutting area of the cutter tooth, and should be slightly higher in the front than the cutter tooth. It is very important that you have the correct size file or grindstone, or you can not properly sharpen the chain, and may even do damage to the chain. My personal preference for sharpening a chainsaw in the shop is to use a dremel handheld grinder with a round stone, and in the field when 110 power is not available I will use just a round and flat file freehand without the angle guide. I have sharpened so many chainsaws that I find I do not need the guide, I am very use to the angle which is about 30 degrees on the cutter tooth, and find the guide only slows me down, I will still use the depth gauge for the raker tooth or depth tooth, whatever you want to call it. 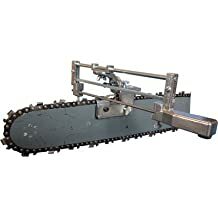 There are basically two different teeth on a chainsaw chain, a cutter and the depth tooth or raker. The first thing you want to do when sharpening your chain is to inspect it for any damage, if there is any significant damage you may want to just get a new chain. Next if there is no significant damage, you should clean as much of the oil and debris off the chain as practical, you can use a little brake cleaner or solvent of some type, just try not to get it on any plastic parts as you may melt them, or you can just wipe it clean with a rag, it does not have to be perfect, you just don’t want to clog the pores of your grindstone or file with oil and debris. Next if you are working in a shop and you have a bench vise available you will want to secure the blade in the vise about three quarters of the way down the bar towards the tip in a manner so the chain can still rotate freely. If you do not have a bench vise you can buy a stump vise fairly cheep, a stump vise can be hammered into a log that is big enough to hold the saw. You do not have to use a vise if you simply do not have one available, it’s just is a little easier and safer, you can simply hold the blade with one hand and sharpen with the other, a good pair of work gloves helps if you have to hold the blade. Most of the time I do not use a vise even though I have one available, but if you are new to sharpening a saw then you might want to get a vise of some sort. If you are using a round file with a guide you will need to figure out how the guide sets on the blade, some clamp on and some just set on top between the teeth, but they should all hold the file at about a 30 degree angle to the blade. The cutter tooth is angled at about 30 degrees and the file should line up with the angle of the cutter tooth, also the file needs to be at a 90 degree angle or a right angle to the vertical side of the bar. The 30 degree angle of the cutter tooth alternates with each tooth, so every other tooth should be at the same angle. You will sharpen one side of the chain first, that is every other tooth, then you will sharpen every other tooth on the other side of the chain. You should try to find the master link of the chain to use as a starting point or mark your starting point with a colored marker or something, so you know when you have sharpened all the teeth. Now holding the file firmly, start on the inside or short side of the tooth, and move the file across the curved face of the cutter tooth towards the outside, or long side of the cutter tooth, repeat this three or four times, then check to see if the tooth is sharp, if not then repeat the procedure a few more times till the tooth is sharp. Always move the file in one direction from the short side to the long side, lift the file and repeat, do not file back and forth on the tooth, the file is designed to cut in one direction, so make sure you are holding the file by the handle end, and start at the tip of the file. You should try to use the same number of strokes of the file on every tooth, it is very important that you file every tooth as equal as possible so the saw always cuts straight. Sometimes you will have a chain with some teeth more worn than others, you will have to use your best judgment on how to get them as equal as possible. vertical side of the bar, and grind for a few seconds, then check to see if it is sharp, repeat this procedure till you have sharpened all the cutters. After you have sharpened all the cutters, you will need to check the height of the rakers or the depth tooth. The rakers determine the depth of cut the cutter makes. The front of the cutter tooth sits higher than the back of the tooth, and as you sharpen the cutter tooth it looses a little height, you will need to occasionally file the raker down a little to compensate the loss in height of the cutter. Take the depth gauge and place it on the bar so the raker sits in the hole at the end of the depth gauge, and the rest of the gauge covers the cutter. If the raker sticks above the hole in the depth gauge then take a flat file and file the raker down so it is even with the top of the depth gauge, then remove the depth gauge and if the front of the raker has a corner from the filing then round the corner slightly so it will pass over the wood smoothly. Some chains have marks on both the cutter and raker to show the proper angle of the cutter, and curve of the raker, use those marks as a guide, that is how to sharpen a chainsaw chain. Note when you are using your saw you should always avoid dirt, any dirt not just the ground, but if there is dirt on the log you should clean it off, with a hose or pressure cleaner, a broom, debark it, or whatever works to get it clean, cutting through even a very small amount of dirt can instantly dull the chain. How often you sharpen your chain is debatable, but you should sharpen it on a regular basis, and as soon as you notice it start to get dull you should stop and sharpen it, by sharpening it before it gets to dull will make the chain last much longer and will avoid wear to the saw. I sharpen my saws every couple of tanks so the saw is always sharp, this saves me a lot of time and money in the long run. Hey Ruth thanks for the comment I apreciate it. A comprehensive and very informative post. It is going to be of a great help for those looking to find an experts advice! This is a nice explanatory and technical article. I believe exactly what each and every chainsaw owner should read. Just as a matter of interest, when I was 17 years old, a running chainsaw fell on my left foot. It cut right through the front of my foot just behind my toe, but it did not went through my shoe sole. I walked home (about 500 meters) and my dad took me to the rooms of a general practitioner who did surgery on my foot with only local anesthesia. It was a great success and 3 months later, I could walk normally. …That’s whats coming to my mind whenever I see a chainsaw. Anyway, you have a very well researched article here. Congratulations on the quality thereof.